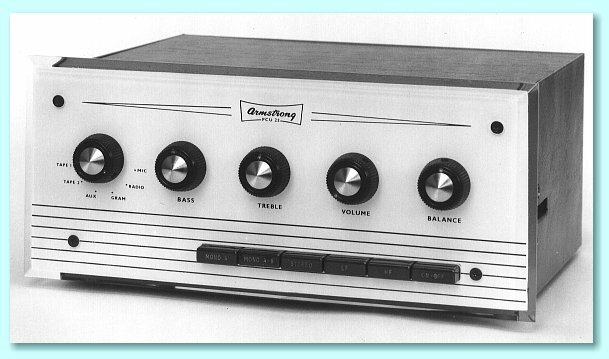 The A20 was Armstrong's first ‘Hi Fi’ stereo power amplifier unit. Previous power amplifier chassis had been monophonic, although these could be used in pairs with a suitable stereo control unit to obtain stereo operation. The company had made previous stereo ‘radiogram chassis’ (what we might now refer to as a tuner-amplifier or receiver), but had not produced a stand-alone stereo power amp until the A20. The above image shows a photograph of an A20 that was used for publicity purposes at the time the design was manufactured. Stability Margin 20dB with rated resistive load. 15dB with 0.1 microF shunt load. Output Transformers: High specification, grain oriented laminations, and multi-sectional windings. Finish: High grade rust-proofed steel with a maroon texture finish. Circuit details: The two amplifiers which are combined in the A20 are identical and each consists of a high gain triode stage coupled to a double-triode phase splitter which feeds into two EL84's in push pull. The above photo shows the PCU25 pre-amplifier (control unit) that was recommended for use with the A20. Armstrong adopted a new external styling at the start of the 1960's with a white perspex facia with lines and legends in black. Cases were in what was described in adverts of the time as “an attractive maroon vinyl-hide covering”. Tape 1 (3mV, CCIR characteristic) For playback direct from tape heads. Tape 2 (100mV) For playback from a complete tape recorder or a tape deck via an associated tape pre-amplifier. Auxiliary (100mV) For additional sources with higher output that do not require equalisation - e.g. crystal pick-up. Gram (3·5mV, RIAA characteristic) For magnetic pick-ups. Radio (100mV) For radio tuners. Microphone (1·8mV) For direct input from most types of microphone. The sensitivities given above are the input levels required for 410 mV output - i.e. the level which will produce 12 Watts per channel from the A20. The nominal frequency response in each case is 20Hz - 20kHz ±1dB. Circuit Details: The two channels are identical throughout and each has a low-noise EF86 in the first stage. This is fed via the rumble filter circuit to one triode of an ECC83, the output from which goes via the tone control circuit to the filter stage, using the other half of the ECC83. 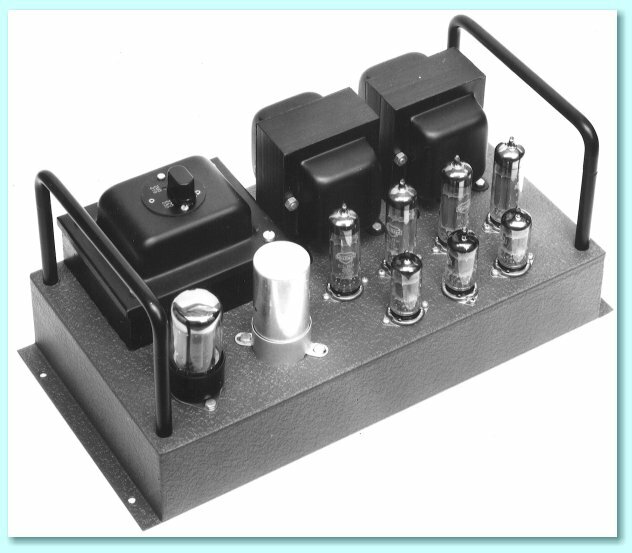 A further triode is used as a voltage amplifier and a low impedance stage, the volume and balance control being incorporated into this stage. Bass Continuously variable +15dB to -10dB at 40Hz. Treble Continuously variable +15dB to -20dB at 20kHz. Balance 10dB range for each channel. Mono A and B Average of A and B sent to both outputs. Treble Changes action of Treble control to filtering. Rumble Inserts high-pass filter to reduce record rumble. When the Rumble filter button was pressed in, a high-pass filter was applied with a nominal roll-off of 6 dB per octave based on a turn-over frequency of around 80Hz. The action of the Treble filter button was more compex. When this button was pressed in it altered the behaviour of the Treble control knob. The Treble control then altered the slope and turn-over frequency of a variable low-pass filter. With the Treble control “at 12 o'clock” the filter had a nominal turn-over frequency of 9kHz and a slope of 12dB per octave. Adjusting the Treble control then applied more or less filtering. The above graph illustrates the actions of the filters. The PCU25 was designed as a relatively ‘no frills’ unit. Those wanting every available feature would be recommended to buy the more expensive PCU27. If you wish to see a detailed circuit diagram of the PCU25 click here.